The motor and such is just is not ready for this type of vehicle. It's just such poor quality in the mechanical things that I do not know what to do with myself. The HUMMER name is so over rated and it is just not worth the price you pay for it. 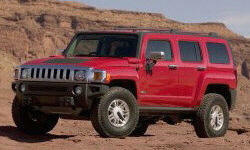 Why the 2006 Hummer H3? Tough look, fits me and my personality perfectly (5 foot 8 and adventurous), a few luxurious things here and there. I was either debating on this, a ss trailblazer, or srt8 jeep cherokee, and of course this one was a steal. Gives me a boost of self esteem! Needed a SUV that I could take off road without worrying about getting stuck or bottoming out. Fits me perfectly, others that are a little taller I'm sure not so much, but I love the small but not too small size. Why Not the 2006 Hummer H3? Over heats and struggles when towing, can't barely even handle carrying four young adults at one time! Lets not even get me started about how small the interior is! Definitely not worth the price! Umm, help, it's kind've falling apart with 130k miles. So plain! It's exactly like a cheap chevy colorado or gmc canyon. Nothing luxurious or special about the electronics at all.